Kicking Coach Brent Grablachoff gives you 'real talk' about the challenges of becoming college ready as a football kicker or punter. 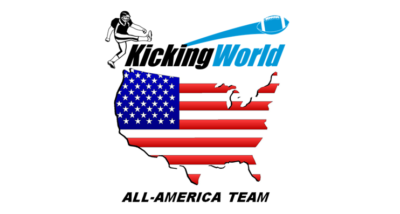 Kicking World is the undisputed leader in the instructional football kicking & punting camp industry. We are fanatical about technique and fundamentals and know that regardless of level – beginner, intermediate, advanced; having a duplicable process and consistent fundamentals are essential to take it to the next level both collegiately and professionally. While many football camps simply ‘chart’ and ‘rank’ students, we provide real instruction and mentorship to all Kicking World campers. We will help you establish a process to follow so that you become more confident, consistent and powerful in your kicking and punting game. It’s important to never think that you are ‘above or beyond something’. We hear from too many kids and parents every year thinking that instruction is more for beginners and what my son really needs is exposure/recruiting and to get his name out there. The reality is many don’t realize that their form/consistency/mechanics are not up to snuff yet by college standards. It takes a LOT to be ‘college ready’ and that is what we specialize in; helping you get ready for college. Do you think a Special Teams Coordinator at a big college cares if you hit a 65 yard field goal messing around with your friend during hurricane winds and did 9 retakes before posting in on YouTube? It does not matter. They are looking for kids who have proven themselves over the long haul. How did you perform in-season? Did you make all or most of your extra points? Did you make most of your short field goals? Do you have your head on straight? Are you a reliable person in and out of the classroom? Coaches want well-rounded specialists they can rely on. MANY kids today can hit 50+ yard field goals, but can you drill a 45 yard and in field goal with the proper lift (speed/time it takes for the ball to get up over the line of scrimmage), without any hook or slice or ball wobble, with perfect end over end trajectory 8+ times out of 10? Some students are ‘camp all-stars’ and that means they perform well with the tripod ball holder and limited pressure at charting camps, but when it comes down to it, many of them crumble under the pressure of a real game. At our camps we give you the ammunition to not only become fundamentally strong, but mentally prepared to go into battle and dominate under pressure. If you’re ready to take your kicking game up a few notches, be sure to check out the Kicking World camp schedule and signup for a camp as soon as possible. You may also schedule a lesson with one of our many qualified kicking, punting or snapping coaches nationwide. Need expert advice & guidance on the recruiting process and help getting your name out there to college coaches? Check out our monthly subscription plans to get unprecedented access to Coach Brent. In addition, we cover many aspects of recruiting, how to e-mail a coach, kicking video highlights, etc. at camps and in his Books & DVDs.